Surprisingly light for its size, in some larger species the bill is equal in length to the body size. The neck is strong and short to help the bird with balance. The bill's structure is formed by a highly organized matrix of thin criss-crossed bony 'rods', filled-in with a spongy form of keratin, creating a horny sheath (similar to fingernails) with serrated edges resembling teeth designed for tearing fruit, the principal component of the diet. The bill is quite weak in the sense that it cannot bite, but it is so incredibly strong that some aircraft have been designed following the principles of its construction. The thin, feather-like grey tongue extends to the end of the bill which is otherwise hollow. The feathering effect exposes more taste-buds, enhancing the importance of taste to the toucan. It is a very efficient thermo-regulation system, serving as 'air-conditioning'. The long reach aids in gathering food, with minimum energy expenditure, and it can reach into areas unavailable to other birds. The bill reaches fruit on branches that might not be able to support the bird's weight. 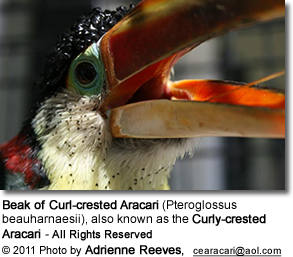 It intimidates other birds, allowing the toucan to plunder their nests. It is unlikely that the bill's coloring or size is related to mating as female and male toucans have similar markings, although the females' bills are usually a bit shorter and straighter. It does play a role in the mating ritual as the pair throw choice bits of fruit to one another. Toucans fence with their bills and wrestle, possibly to establish hierarchy within a group. It is theorized that subtle distinction in bill markings help individuals identify one another. Berries and seeds are collected with the tip of the bill and then flipped into the throat by tossing the head. 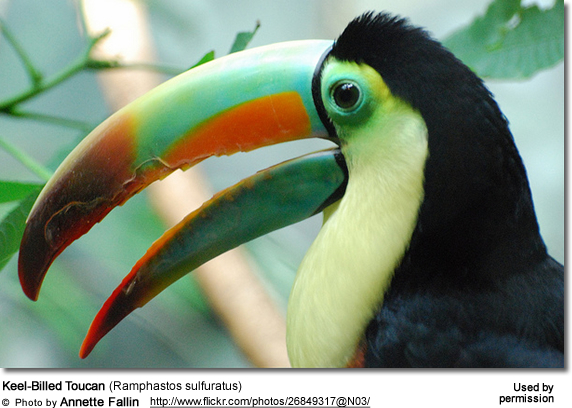 Toucans supplement their diet with insects, small lizards, eggs, and the nestlings of other birds. This extra protein is required during breeding season. Toucans in captivity must be fed a diet specific to the requirements of their species which make them difficult to breed and raise, as they are subject to health problems such as hemotomacrosis. Many breeders do not support them being kept as pets as the current supply in captivity is not enough to sustain the demand (for zoos and other such venues) and this increases them being harvested from the wild.